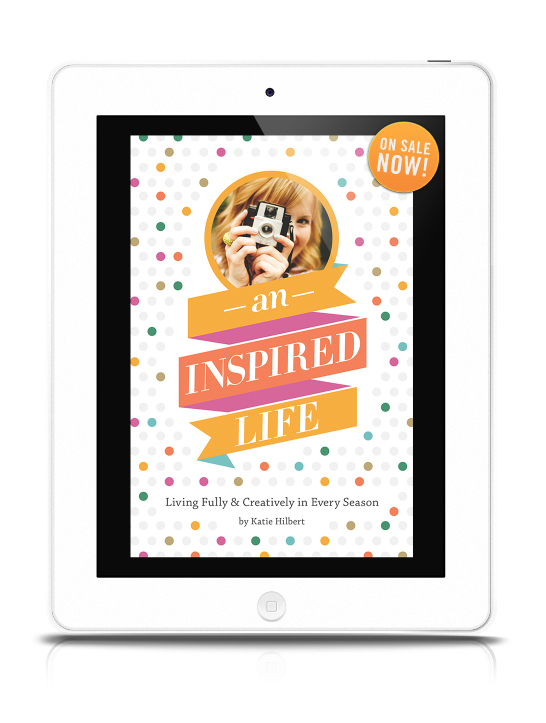 An Inspired Life: One-Day eBook SALE! 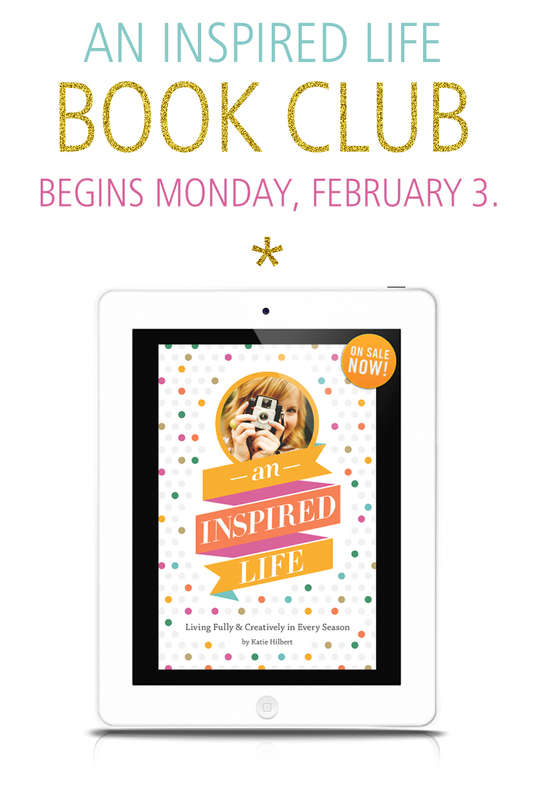 In celebration of books, the coziness the winter months bring, (AND to kick off your holiday week with a little extra inspiration), I’m offering a special discount today on my book An Inspired Life. Enter the code GETINSPIRED at checkout to save 25% off your purchase. An Inspired Life will encourage you to reflect on the past year, be present in your current moments, and dream big with Him in the new year ahead. So, snag your copy today, grab your favorite mug and cozy beverage (lately, I’m partial to peppermint mochas! ), and join me on an adventure to live fully and creatively for the Lord. I wrote An Inspired Life to encourage others to live full, creative, and inspired lives for the Lord. In it, I share glimpses into my own heart and story, as well as photographs I’ve taken and art journal pages I’ve created. I also hand lettered each chapter title to give the book an art journal-like feel. I hope that while reading, you’ll be encouraged to do some journaling of your own, too. The book includes colorful Prayerful Prompt pages that you can print out, journal on, and pray through, as you read. We spent many hours dreaming up the design and then bringing it to life. And plenty of coffee was consumed during the process (as evidenced above). ;) We’ll be sharing more about the design process in an upcoming post. And if you want a little preview, you can read the book’s introduction, here. So, without further ado, I introduce you to An Inspired Life. I hope that if you read it, you’ll be blessed and encouraged in beautiful ways. A few weeks ago, I spent my Saturday morning in the sunshine, picking out colorful mums and pumpkins to fall-ify my porch. After loading my car with fall goodies, I stopped by my local coffee shop for an iced caramel latte. Then, I settled myself at my bright blue bistro table and got to working through my Lara Casey Making Things Happen booklet from The Influence Conference. I’m still thinking through the core of my business — and the heart of A Place to Dwell. I’ve already started dreaming up some new ideas and products for 2014 — things that I hope will help, encourage, and equip others to live inspired lives of possibility for the Lord. That quiet time on my porch also inspired me to check in on my 2013 goals. Remember my vision for 2013? Inspired, encouraging, balanced, intentional, going further with an open heart. I will embrace my story and my season, living fearlessly, fully, and creatively. I will abide in Him and dream with Him, using my God-given gifts and passions to pursue what He’s laid on my heart. I will pray boldly, trusting His guidance. I desire to see a fruitful harvest in my life that glorifies Him and blesses others. My vision for 2013 is to be more of the woman He created me to be —inspiring, encouraging, and spurring on the people He puts in my life. My vision for 2013 is to bear His fruit in my writing, in my artwork, and in my relationships with others. I feel hugely grateful to read back through those words and see the way God has taken my offering of them and brought life and color and adventure out of each humbly written one. 1. Write, design, publish my eBook. This book is my heart right now, and I am so, so excited to finish it and release it into the world. I’m already praying that it will be a blessing to those who read it. I just saw the final proof of this a few days ago, and I’m excited to say it will soon be listed for sale on my site. It has been an incredible adventure (with a few bumps in the road), but it’s blessed me and stretched me in so many ways. I’m especially thankful for the collaborations God orchestrated throughout the book’s creation. I learned a lot about myself as an artist and how much more alive and creative I feel when I get to create art with others. 2. Grow as a teacher/speaker/writer. In the five-fold ministry quiz, I rank highest in the areas of Pastor and Teacher. This year, I want to really dig into those two areas and further develop them — stepping even #FURTHER into the calling the Lord has placed on my life. I also want to grow as a writer, continuing to develop my voice and stretching myself creatively as much as I can. Leading a women’s discipleship group, attending the Influence conference, participating in The Nester’s 31 Days of writing challenge…God brought many opportunities this year that pushed me to grow and learn. 3. Pursue new freelance opportunities and creative collaborations.There are a few publications I am dreaming to work with, and I need to get my ideas on paper (and in e-mail form) and reach out. I also want to just collaborate more with creatives in general. I get so jazzed about working with other talented people who love to make stuff, and I want to do so much more of that this year. It’s inspiring. It builds community. And it’s just so very good for the soul. I wrote for The Influence Network Magazine and the newly launched Venture Magazine this year. And I’ve already mentioned my eBook collaborations. This goal has only further confirmed how much I value working with other creatives. I know it will be a part of my 2014 goals, as well. I’m already praying over some ideas I have to establish something inspiring for local creatives, and I’m excited to see how the Lord develops it. 4. Make intentional investments: in relationships, in His Kingdom, in developing my God-given passions, dreams, and ministries of writing and art. I want to be intentional in 2013. I want to seek Him daily. I want to hear His voice and respond. I want to always be asking myself these two questions: “What is God saying to me?” and “What am I going to do about it?” And I want to be intentionally inspiring, encouraging, and spurring others on, building community and relationships, and bearing His fruit in everything I do. This is a goal I think I’d like to have on my list every year, honestly. God is teaching me so much about intentionality, and I know this is an area I can continue to grow in. 5. Fight for my future marriage: We just completed a series at church about fighting for our marriages, and while I might not be IN a marriage currently, I can certainly fight for my future marriage. And I want to. I want to be a blessing to my future husband, even now, in singleness. I want to keep praying for him. I want to keep growing and being mentored and learning about who I am and what that might mean for our future relationship. I want to know — truly know — everything the Lord has to say about marriage, and I want to carry that truth in my heart. I want to be pruned and prepared. And I never want to stop hoping. I want to guard my heart against discouragement and know that His timing is perfect, and it’s always worth the wait. I think this year I’ve learned even more about who I am and what I hope to cultivate in my future marriage. I’ve come to see very clearly that He’s made me a dreamer — and an encourager of dreams. And I’ve realized how much I hope to find someone who will dream for the Lord with me, someone who also values creativity and using it to build His Kingdom here on earth. Also, just reading this goal again this morning, I was blessed by these words: And I never want to stop hoping. I want to guard my heart against discouragement and know that His timing is perfect, and it’s always worth the wait. I needed that reminder, and it’s amazing that by writing this goal, I am encouraged and strengthened months later. 6. Seek balance: I want to be intentional about how I’m spending my time this year, and I want to be intentional about establishing a healthy balance in areas like online life/offline life, work/rest, etc. I want to pray and fast (and also pray more and worry less). I want to create more with my hands and not just at a computer. I want to get back to painting, collaging, and art journaling. I love typing out my thoughts, but I am also fulfilled in such a different way when I’m creating with my hands — when it’s messy, and imperfect, and tactile. I know I need to make more space for this in my life. I also want to eat healthy, fresh foods and exercise more. I want to joyfully create and work hard to accomplish my goals/dreams, but I also want to just experience the goodness of living life. This goal is another area I want to continually grow in. I did a lot of hand lettering for my book, so that was a great opportunity to create away from the computer. I also just recently signed up for a Skillshare class on hand lettering. Truthfully, balance is something I’m still learning, and I know He will be faithful to continue to guide me through that. It looks different in every season, too. 2013 was a year of pretty intense creativity and art making. A year of taking a lot of risks and doing things that scared me. I’m excited to see what 2014 will look like. Whew, that was a long update, but it felt great to write. It gave me the chance to really reflect on everything the Lord has done in my life this year — and it planted the seed of excitement for next year. I’m excited to start dreaming about what’s to come and set intentional goals to grow and create even more for the Lord. How are you 2013 goals coming along? Are you starting to dream about 2014 yet? In every season of our lives, we can trust the One who’s scripting the story. We can embrace each and every day with passion and purpose, with hope, and with open hearts and open hands. We can live inspired lives that glorify Him — lives full of joy, possibility, and creativity. I wrote those words to describe the book I’m getting ready to release. I wanted to share them with you today, because this project has truly been a project of belief. In dreaming and writing it with Him, I’ve had to believe in the words He’s given me, in the story I’m living for Him, and in the resources He’s blessed me with to complete it. I don’t know what your projects of belief are, but tonight, I want to encourage to press on, press into Him, and rely on Him to see you through to their completion. In writing these words, I’m also reminded of a favorite line of scripture: He who began a good work in you will carry it on to completion until the day of Christ Jesus. We can believe in His work in our lives…in the work that He’s doing and in the work that He WILL do. It’s a good promise to rest in this weekend, isn’t it? Whew, it’s been hard to spend time at this little space lately. Since I’ll be releasing the eBook in the next few weeks, it’s been difficult to create new content here. I’ve made my peace with that, but I hope you all haven’t given up on me. ;) I promise to be back regularly once the eBook has made its debut. AND I have plenty of Creating an eBook posts brainstormed that I just need to sit down, write, and share. I also have a few photos to share from behind the scenes of creating the book. I’m in the design phase now, working with a friend of mine to make it pretty. I get more and more excited every day, as we discuss fonts, layouts, and select photos and art. I’ll also be launching a website for the book next week where you’ll be able to learn more about the book and even read the intro. In the meantime, I’m still posting on Instagram and Twitter, so catch up with me there!